Energy is the backbone of any country’s economy. With the latest trends across the globe, economies are trying to reduce the energy consumption with optimum usage. Optimum Energy consumption also helps to reduce the effects of global warming which is a threat to our mother earth. Huge investments are done and under processing stage by governments and independent bodies such as World Bank, ADB, etc. to explore the new ways of renewable energy resources. The main focus of all countries is to explore the new ways to reduce the energy consumption. Giant MNCs’ (Multi-National Companies) are trying to provide new technologies so that energy consumption may reduce to a great extent. In fact, MNCs’ are providing new platforms such as usage of Wi-Fi, Bluetooth, IoT, technologies for the best results. End-users are also updated about the benefits of using such technologies while finalising their products. Recently, Light India fair was organised at Pragati Maidan, New Delhi, in which numerous of light manufacturers participated and their presence with their products increased the grace of the light fair with multiple folds. Light India Fair is a platform where designers and manufacturers can interact with each other and have detailed discussions about the latest trends in the current market conditions. Such type of Light Fairs greatly becomes source of huge knowledge. Participants were explaining about their newly launched products. Also, many lighting designers were also participated in the Light Fair. Also, one of my friend who is working on a new StartUP on Artificial Intelligence (AI) and Machine Learning (ML) concepts also appeared in the Light Fair. Both these concepts allow the use of computers without providing any suitable programming and computer will work according to the analysis of the stored data. These new concepts will be helpful to great extent where computer will execute the decision based on the stored data without any pre-programming. Generally, it is learnt that lighting designers are reluctant to use software for the lighting illumination design. Many companies have developed Special Software which can be used for the illumination design of the external as well as internal surfaces. Many such software (such as DIALux 4, DIALux EVO, AGI32, Relux, Radiance, etc.) are available in the market. These softwares are widely used by the majority of lighting designers across the globe. Some of the companies have provided their software at free of cost while others charge fee to grant licence version of their software. Also, one of the students during his graduation time has submitted a thesis on “Comparison Study of Four Popular Lighting Simulation Software Programs (viz. DIALux, AGI32, Relux & Radiance)”, in which student tried to explore the largest users of a particular lighting simulation software across the globe depending on number of users, accuracy of results, etc. It is worth mention here that Lighting Designers’ are feeling comfortable in using Photoshop Software for creating lighting effect. Photoshop Software is nowhere related to lighting design. In fact, lighting design provides illumination level requirement as per the site condition, in which illumination at a particular surface can also be obtained. Lighting design using Photoshop Software does not provide the different parameters related to fixtures during the design stage such as mounting height, location co-ordinates and projection angle, which are requisite while execution stage. Also, in Photoshop Software, designers are used to creating lighting effects by using a photograph. Further, with the arrangement of these modified photographs in the form of MS-PowerPoint, a movie type effect created which attracts the clientele. But, such type of illumination designing does not provide the accurate results such as illumination level, total energy consumption, glare level, uniformity of illumination, etc. It is worth a mention here that while light illumination is designed for any building / area / or any other place, many factors play important roles to a great extent, such as maintenance factor, texture material/colour, reflectance factors of surfaces (for wall, ceiling, floor), occupancy level. These factors greatly affect the quantities of light fixtures and also the quality of the illumination design. Hence, then how can lighting designers’ neglect these factors while designing a lighting illumination by using Photoshop Software? Also, many manufacturers of light fixtures are doing testing of their products either in their own laboratories or from recognised laboratories,to get the photometric data (.ies file) of their products. Such manufacturers are engaged in a partnership with the Software developing companies which can help the designers’ for using their photometric data during the design stage. These manufacturers are investing huge amount of their profit to get the photometric data, so that designers can use their product data for accurate and optimum design during their design stage for real time simulated result. Also, few lighting software are available with an option to design the light illumination system with the consideration of daylight factor during the design stage, which helps to reduce the energy consumption during day time. Also, Light fixtures are available with in-built sensors which can activate the dimming of light fixtures as per the daylight conditions. Some of the designers’ categorically claimed that facade lighting is best presented by using Photoshop Software and using software such as DIALux EVO, will be critical and it shall be time consuming. It is worth mention here that best quality work comes only after investing time with sincerity and dedication. Here I am not criticising the application of Photoshop Software by the lighting designers’. That is their own prerogative. Also, I am not insisting to any designer to use a particular Lighting Simulation Software during design stage. My view is clear and loud that when beam of light comes out from a light fixture, nobody can predict the direction of light beam and also how will the surface appear when light beam fall on it. Then, how can lighting design using Photoshop can be recommended and accepted by such Light Designers? 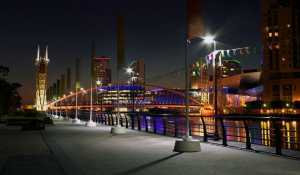 In India, Light Design using Lighting Simulation Software is in neglected stage. Importance of Light in human life can be explained with the Circadian Rhythm. Here, only few people are available to appreciate the benefits of lighting illumination design using simulation software. Many times designers submit their illumination design in over-cast condition which results huge loss in terms of material cost as well as running cost after the commissioning of the projects. These lighting design software provide the high level of flexibility to designers at the design stage which can help to understand the actual work involvement.